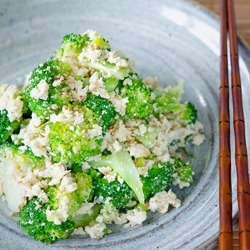 You are here: Home > Archives > Recipes > Easy and Simple > Tofu Broccoli Salad; simple, healthy, and yes, it’s delicious! This is what Glinda, the pretty Good Witch of the North, said to Dorothy in the Wizard of Oz. I don’t think she ever realized that some bad witches can be quite beautiful. At least Elphaba, the Bad Witch of the West, was. She had a certain radiance that captured the winkie prince Fiyero’s heart, which the pretty Glinda herself couldn’t. Last month I drove over 4 hours to Singapore with my family to watch “Wicked,” the famous Broadway show. It was undoubtedly a great show and my kids just loved it. But for some very WICKED reason, I kept thinking of “broccoli” while I was watching. It could be Elphaba’s green face or the green emerald city in the land of Oz on the stage. Or it could simply be that I’d gone mad, which happens from time to time. Whatever the reason was, I was inspired with broccoli and happy to present it today. 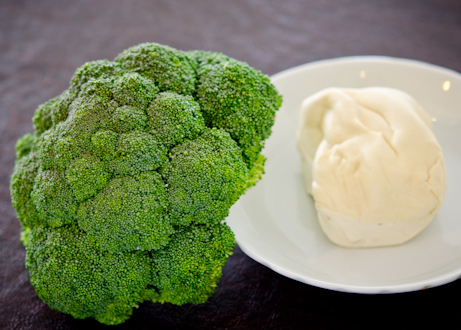 I never had broccoli as I was growing up in Korea, nor I have seen it until I came to U.S over 20 years ago. Although broccoli wasn’t widely available for my childhood, which some of you might think that as “lucky”, you can find them very easily anywhere in Korea these days. My first encounter to broccoli was “scary”! I thought I was eating a wicked moss ball. After a few attempts, I began to enjoy their green beauty! I love them.., I love them to death now. Here is one dish that you can fuse this glorious vegetable with tofu. It is easy and delicious, not to mention of their super healthy power. 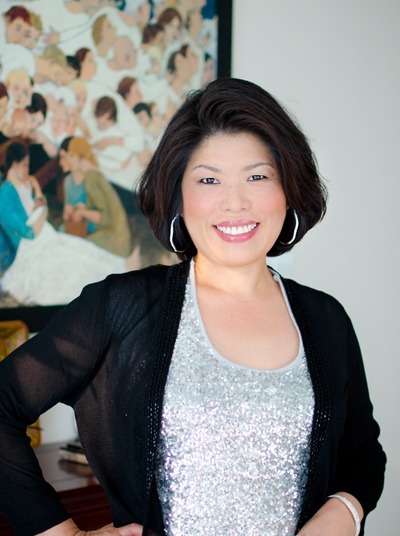 You just need to know a simple technique to bring out the true radiance of Ms. Broccoli. 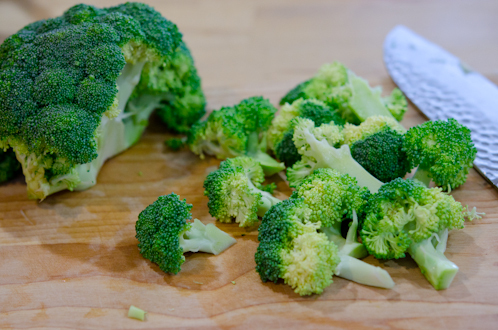 Cut up the broccoli florets into small pieces. 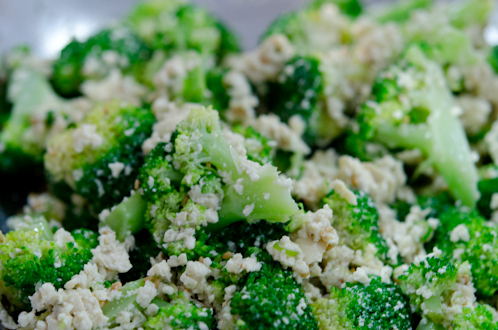 Place broccoli and tofu in a hot steamer and steam for 2-3 minutes until the broccoli is tender yet retains their green beauty. Tender yet green…, hard to achieve, isn’t it? 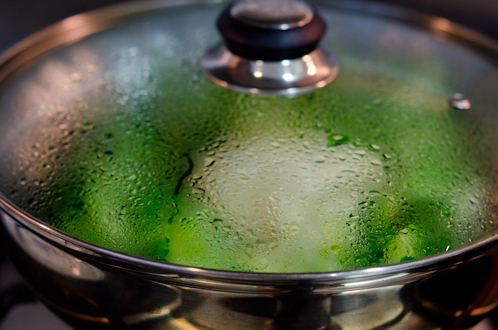 Rinse them in the cold water to stop cooking further. 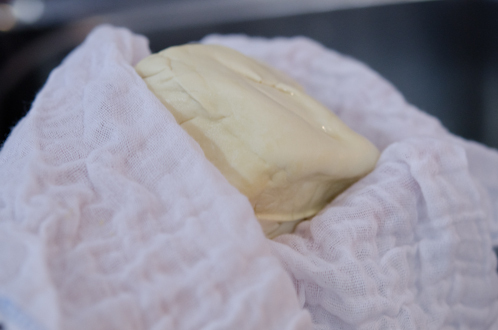 Wrap tofu with fine cotton cloth (or cheese cloth) and squeeze out to remove some water. Place them in a shallow bowl but don’t combine yet. Get these stuff. 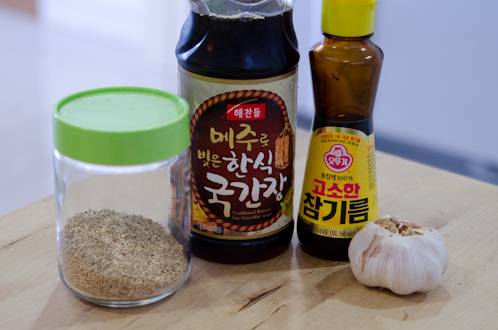 Sesame seeds, Korean soy sauce for soup, sesame oil and garlic (minced). 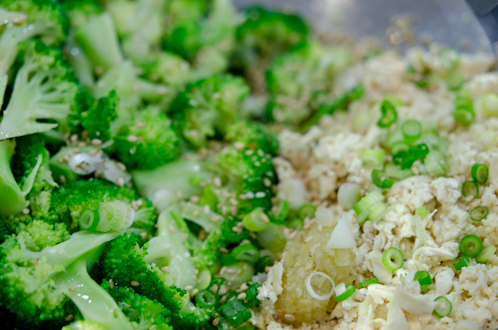 Oh, don’t forget to add chopped garlic and green onion, sesame oil and sesame seeds . Start massaging around your tofu with seasoning… because you love him so much. 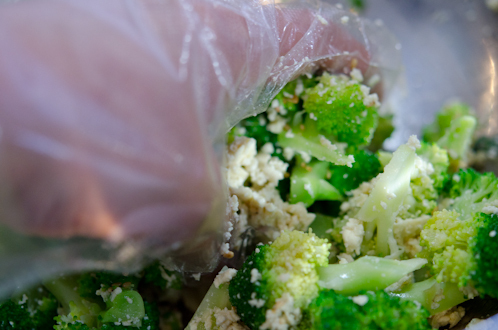 This step will season the bland tofu without bruising the broccoli. Now, gently toss all together. Taste and season with salt if you need. Any other words I’m missing? 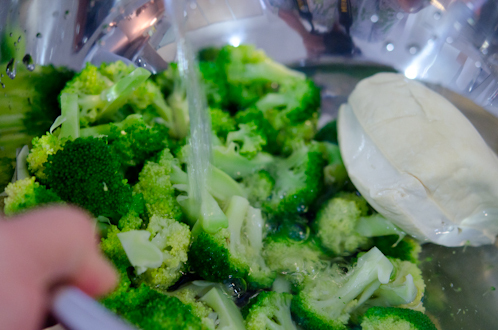 Place a steamer over gentle boiling water on medium heat, place broccoli and tofu and steam for 2-3 minutes or until the broccoli is tender yet retains their green color. Take them out and rinse in the cold water. 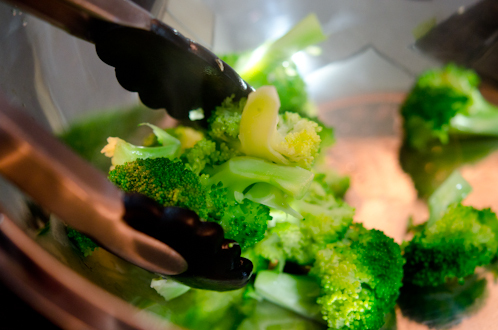 Place broccoli in a large shallow mixing bowl, set aside. Wrap tofu with fine cotton cloth (or cheese cloth) and squeeze out to remove some water. 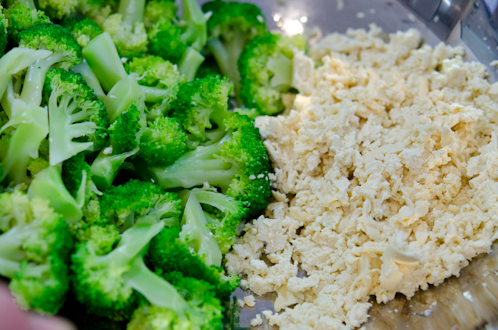 Crumble the tofu and place next to the broccoli in a mixing bowl but don’t combine them yet. 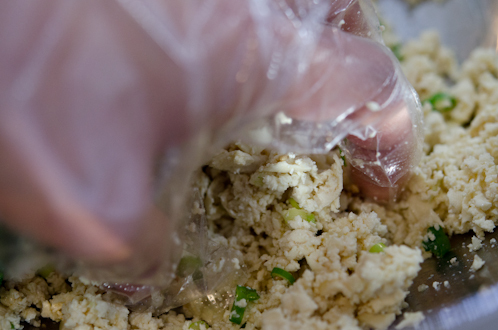 Add garlic, green onion, 1 teaspoon of Korean soy sauce for soup over crumbled tofu and massage around the tofu so that tofu gets seasoned alone. 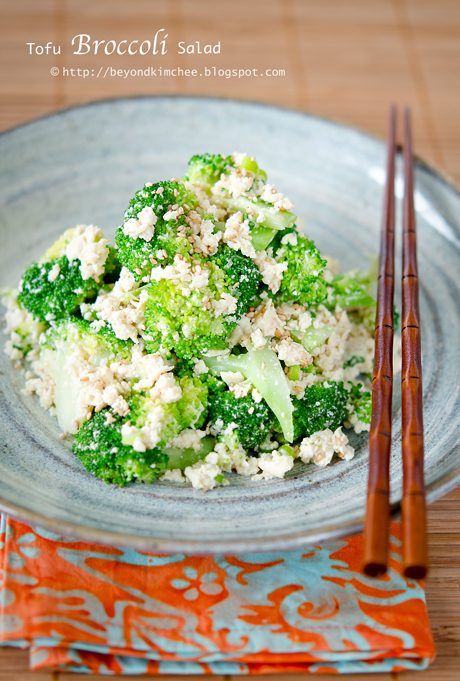 Drizzle the rest 1 teaspoon soy sauce and sesame oil sesame seeds over broccoli and tofu, and toss all together very gently. Season further with salt if you need. That looks so very delicious! This may be a stupid question, but don't you need to cook tofu? No, it is not a stupid question. Tofu can be eaten raw. If raw tofu is a concern, you can boil the tofu in water first before you use it. It certainly looks yummy and delicious. It is a very quick, easy and hassle free recipe indeed! 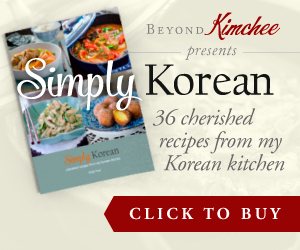 sure looks easy,and quick to prepare.Will try the recipe.thank.you.love korean dishes esp bulgogi......we normally have them at korean restaurants in and around klumpur. I love this!! I can't wait to try it out!! Hi Raina, Hope you can give it a try soon. Bulgogi is everyone's favorite. Thanks for the comment. Yes, it is. And it is nutritious, too. 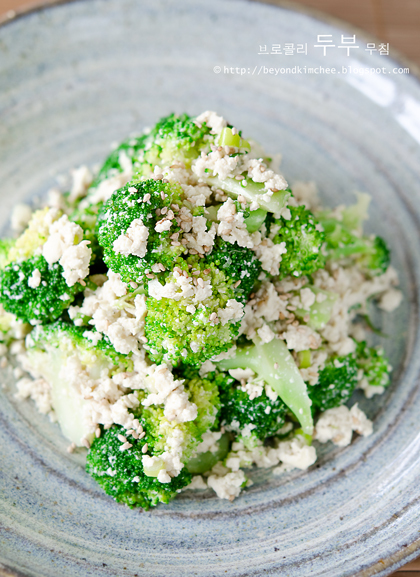 If you like tofu, and hopefully like broccoli as well.., then you will like this dish. Nice dish and a great way to use tofu. How does "Soy Sauce for Soup" differ from regular soy sauce? This looks delicious! A lot of Korean food seems to be vegan-friendly, which I love. I'm making up a list of your recipes to make! It is saltier than regular soy sauce with more pungent flavor. 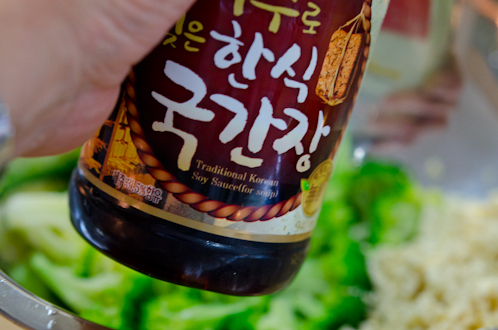 Similar to fish sauce but milder and of course it is made from fermented soy, not fish. I love the jump from "OZ" to broccoli. Ha. Your blog is beautiful! your food looks delisH! love this it looks just yummy. This recipe is delicious! My whole family loved it. I will be making it again. Thanks, Holly. I like kimchee. very delicious!! This looks good, I'm adding it to my collection of salad recipes that I can bring to work. I'm going to try this recipe for sure. Thanks for sharing! Wow! So simple to make. Just made this dish and LOVE it. My new favorite salad. Thanks so much for this recipe! I love it. We're making this for our restaurant assessment next month. What is it called in Korean? You can call it "tofu broccoli muchim". Hope you like it. Thanks!